Welcome to the Astronaut Portrait Autograph Hall of Shame, a collection of some of the most 'atypical' space autographs known to man. 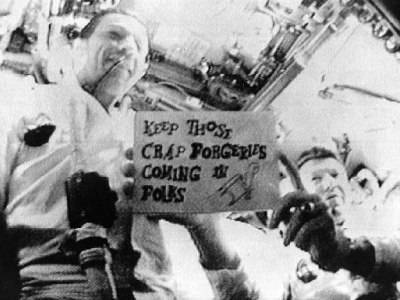 With the world's most famous astronaut refusing to sign autographs for some years now, and the resulting stratospheric climb in the prices fetched by his autographs in the secondary market, it is inevitable that forgers would move in to fill the gap and rake in the cash. Judging whether a signature is genuine or forged is often more of an art than a science, as skillful forgeries can be extremely challenging to spot. This mini-site is dedicated, however, to those signatures that are so 'atypical' that the challenge is in trying to identify whose signature it is actually supposed to be. Often the only clue is the photograph used. Legal disclaimer: All opinions expressed in these pages are the opinions of the author. All images are believed to be in the public domain but will be withdrawn if requested by the owner. If you are the owner of one of the above items and believe it to be a genuine signed article I'm very happy for you, but would suggest you seek expert advice on the matter, or psychiatric help. If you see a laughably-atypical astronaut signature up for sale that isn't featured here please let me know! These pages are best viewed using a recent version of Mozilla or FireFox.